Mauritius, one of Africa’s smallest countries with just over a million inhabitants, is an island paradise. The island is filled with colour, culture and of course stunning white sand beaches. 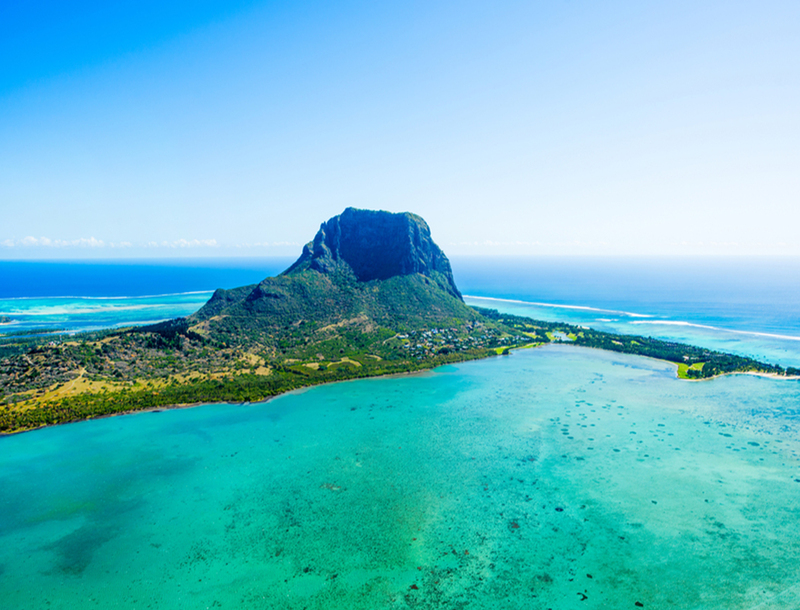 Here’s 5 Reasons why you should visit Mauritius. What first comes to mind when thinking about Mauritius are without a doubt the sandy, clear water beaches. Warm Indian Ocean waters surround the island of Mauritius making it perfect for swimming. Additionally, the entire island is surrounded by beautiful coral reefs. There are plenty of shiny lagoons where you will find lots of fish, and ideal for snorkelling. Mauritian cuisine is extremely diverse. Essentially a fusion of French, Indian, African and Asian food, your palate will experience the most unique flavours and leave you wanting more. The land is rich and fertile. Fruits and vegetables grow in abundance which means the food served, is as fresh as it gets. Perhaps the most popular of Mauritian dishes is: Dholl pori. Influenced by Indian cuisine, Dholl pori is similar to a roti made from ground yellow split peas, and usually filled with a bean curry and chilli. Another popular dish is daube; chicken fried with onions, garlic, ginger and spices before being stewed in a tomato-based sauce with chillies. Mauritian cuisine is a blend of many flavours that perfectly compliment each other. The climate in Mauritius is ideally suited to water sports all year round. In winter, its super windy, making it the perfect time for windsurfing and sailing. The water sports don’t end there, from kayaking and parasailing to deep-sea fishing and scuba diving, there’s something for everyone. If you want to walk on the sea floor, try the amazing underwater sea walks. Try exploring the ocean via mini submarine. Your water sport options are endless. While it may seem like Mauritius is all about the beaches, the island has some of the most beautiful botanical gardens and nature reserves just waiting to be explored. One of Mauritius’ oldest Sir Seewoosagur Ramgoolam Botanical Gardens feature over 500 species of plants, including giant water lilies. At Île aux Aigrettes, off the southeast coast of Mauritius, you can find birds including kestrels and pink pigeons, as well as giant tortoises. In addition, there are the dazzling waterfalls and tropical forests also filled with beautiful flora and fauna. Mauritus is home to some of the most luxuriously appointed hotels and beachside resorts in the world. The One & Only Le Saint Geran Hotel, nestled on its own private peninsula on the East Coast of the island, offers unparalleled luxury with 24hour butler service and world-class accommodation. With reef waves, protected lagoon waters, and ocean breezes, the hotel boasts a multitude of aquatic recreational opportunities. Another one of our favourite resorts is the Lux Belle Mare; located on the East Coast and one of the best beaches in Mauritius, Lux Belle Mare offers uninterrupted soul-stirring sea views, soft white sands, clear blue waters and tall coconut palms swaying gently in the breeze. In addition to the incredible scenery, the resort offers 5-star luxury amenities as well as four restaurants offering world-class dishes to tingle your tastebuds. These are only two of the many incredible resorts you can relax at during your Mauritian getaway. We’ve only listed five but there’s so many more reasons to visit Mauritius; so don’t waste any more time, book your Mauritian escape and jet off to one of the world’s most incredible islands.